Pattison’s Patisserie is a great example of a quality coffee shop. 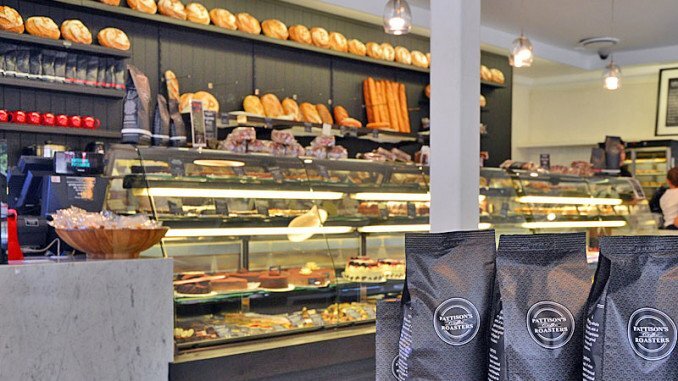 I can see Michelle and Peter Pattison cringing as I say that, because Pattison’s Patisserie is so much more than just a coffee shop, with a range of breads, cakes, pies and other delicacies which are second to none. But most people will drop in for a coffee and then be tempted by one of their vast range of delicacies. Established in 1995 by Peter and Michelle Pattison the business is still owned and operated by the Pattison family. Although they now have five other stores and a tasting room spread out across Sydney, I have ventured in to their St Ives store, where it all began. This store is fresh and modern. The ambience is clean and light, with friendly staff. The cabinets are bursting with fresh delicacies and so selecting a single item is a test of my resolve. I choose the caramel slice to go with my cappuccino. The coffee is strong and creamy and the slice is lovely; lots of caramel, sitting on a thin base with nice layer of chocolate on top. I have a sweet tooth and have eaten many caramel slices and this one is the best. It’s a fine example of quality over quantity. I have had bigger caramel slices, usually with much thicker bases and gravelly caramel. This slice shows you how it should be done. Reading the Pattison’s Patisserie website they state “Our aim is to be the finest boulangerie and patisserie and we understand the finest foods can only be prepared using quality ingredients at their peak. Even our coffee is specifically chosen and roasted to compliment our flavours and products.” That’s a hard promise to live up to, seven days per week. Pattison’s Patisserie manages to live up to that promise.